It was a moment to electrify any game, let alone a must-win FA Cup quarter-final replay, and if it provided the latest evidence of Marcus Rashford�s rare talent, it crackled with meaning for Louis van Gaal. Manchester United had taken a kicking on so many levels after their 3-0 defeat at Tottenham Hotspur on Sunday and Van Gaal, as ever, had borne the brunt of it. It was impossible to ignore the subplot here that the manager needed a result more than ever. He got one and, even better, it came on the back of an entertaining performance. It was fired by Rashford�s goal, and what a goal it was. Accepting the ball from Anthony Martial towards the left-hand edge of the West Ham penalty, the 18-year-old dropped his shoulder to buy himself a yard of space before opening up his body and fizzing an unstoppable right-footed curler into the far top corner. It was Rashford�s sixth goal in 11 appearances for the Manchester club and his overall performance � heavy on pace, fearlessness and direct running � was the sort to cheer up the club�s supporters after a pretty gloomy season. It was also one that showcased his character. Rashford had been brought off at half-time against Tottenham. This was quite the response. What a cup tie this turned out to be. Apart from the opening 15 minutes, the visitors had been in charge and they looked home and hosed when Marouane Fellaini smuggled home their second goal. 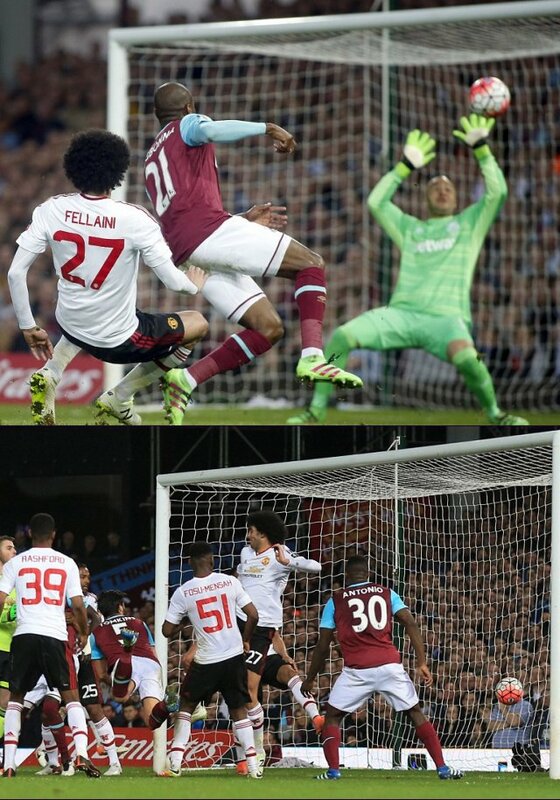 Van Gaal�s selection of Fellaini had been motivated, in part, by his physical power, particularly in the air. The 67th-minute goal was a bonus. West Ham were below par. Their passing was out of sync and they lacked composure. But they roused themselves for a grandstand finish in what was the last ever cup tie to be staged at Upton Park. Were it not for David de Gea, they might have forced extra time. Belatedly, West Ham seemed to realise that they had Andy Carroll on the pitch and it might be a good idea to load the ball into the box for him. After De Gea had pulled off a reflex save to deny Michail Antonio at point-blank range from one corner, Carroll headed the subsequent one back for James Tomkins to score and this famous old ground shook. Rather abruptly, the visitors� comfort and defensive confidence deserted them. West Ham sensed a reprieve. Carroll leapt and, with time appearing to stand still, he flashed a header over the crossbar, while in the 89th minute, De Gea made a marvellous double save to keep out Cheikhou Kouyat� and Carroll. On the second rebound, Kouyat� put the ball into the net only to be pulled back for offside. It was breathless stuff but, at full time, Van Gaal could exhale. It will be Manchester United that face Everton in the semi-final a week on Saturday. Not for the first time, the Dutchman had dug out a significant result from the jaws of crisis. Van Gaal has seemingly been drinking in the last-chance saloon for so long that it is a wonder he can muster anything coherent. The charge has been that he cannot, and he had been tracked to east London by concerns that related to his team�s lack of expression. This was so much better. West Ham had started with tempo and aggression, and De Gea needed to save from Enner Valencia, but Van Gaal�s side responded, with Rashford to the fore. On a number of occasions, his quick feet and acceleration enabled him to burst away from tacklers. He skinned Antonio on 22 minutes before having a shot blocked while a similar injection from him set up the big chance of the first half. Rashford raced clear before squaring for Jesse Lingard who, under pressure, shot low and was denied by Darren Randolph�s outstretched leg. Lingard, who impressed off the flank, would love to have his first touch again. Randolph had also denied Fellaini in the 18th minute, after Lingard�s smart through ball, while Rashford fluffed a volley from Timothy Fosu-Mensah�s driven cross before half-time. The breakthrough came when Antonio�s loose pass under pressure from Ander Herrera fell to Martial but Rashford still had plenty to do when the ball reached him. The finish was clinical and instinctive. Fellaini got the second when he adjusted to steer home Fosu-Mensah�s deflected cross with his thigh to spark celebrations from Van Gaal in the dug-out. West Ham would give him a scare but he and Manchester United are bound for Wembley.